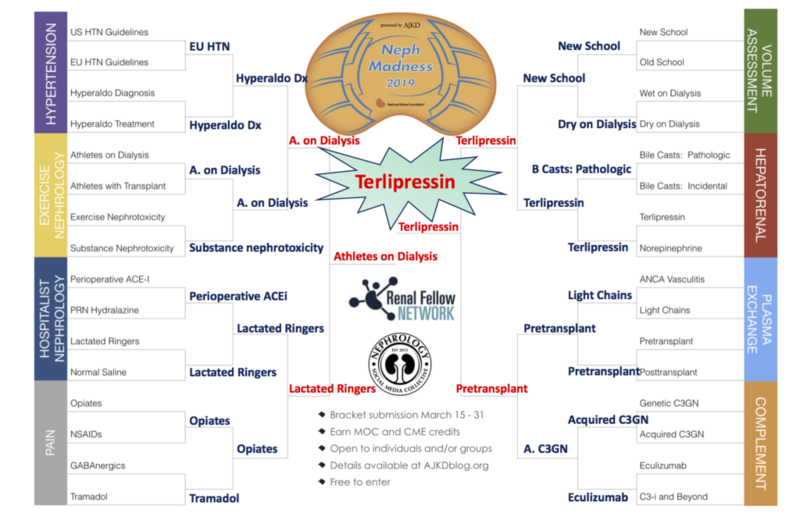 NephMadness has begun! Submit your 2019 NephMadness picks here. We’ll review some NephMadness basics below and leak our picks for this year. NephMadness is an educational game played out across social media, modeled after the US college basketball tournament March Madness. Instead of basketball teams, 32 topics in 8 categories in nephrology are pitted against each other. Winners are chosen by a Blue Ribbon Panel of experts. Participants submit their picks and brackets starting today, March 15th. After the bracket submission period ends on March 31st, the saturated 16, effluent 8, filtered 4, and ultimately NephMadness champion will be sequentially revealed. The NephMadness champion will be crowned on April 8th. 2. How do I decide who wins in my bracket? Read the “Scouting Report” posts on AJKD blog on each topic written by experts in the field that are an in-depth, referenced review of the topics. Then, decide which topic you think should move on to the next round. Still can’t decide? Flip a coin or try to predict how the Blue Ribbon Panel might vote. Take a look at our bracket above and how we got to our champion, terlipressin. These years challengers are: Pain, HTN, hospitalist nephrology, exercise, complement, plasma exchange, volume assessment, and hepatorenal. 3. What do I do after I submit my bracket? 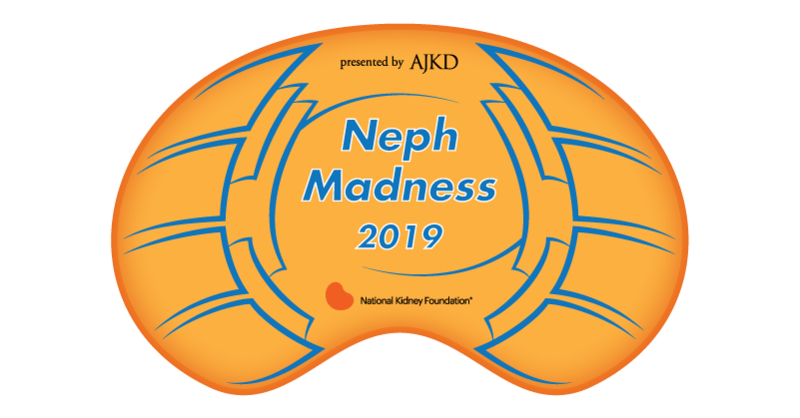 Get involved in the conversation on Twitter and follow the hashtag #NephMadness. Support your picks, share your thoughts, and learn something! Not happy with how the Blue Ribbon Panel voted? Try the hashtag #BlueRibbonFail. Yes! Prizes will be award to those with the highest individual and group score as well as the highest scoring medical student, resident, and fellow. New this year is best NephMadness Party. 5. Can I submit multiple brackets? Ready to play? Register and start filling out your bracket! You’ll have until March 31st at 6 PM to finalize and submit your picks. Who’s your champion?